Working effectively with the lab during a restoration depends on our ability to see things from the lab’s perspective (same goes for the lab with the dentist). This is especially true when cementing and bonding with e.max. In Dr. Brady’s previous blog on Ivoclar Vivadent’s IPS e.max as a versatile ceramic, she explained many advantages to the product. She also dove into the challenges most people encounter when using e.max. Here is the challenge with e.max: the lab can’t call to tell me I have too little occlusal clearance unless they know how I intend to use it. 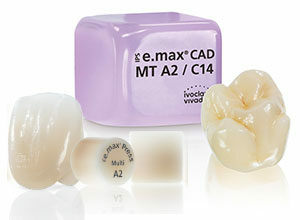 If I’m cementing a monolithic e.max crown in the posterior, it’s 1.5mm. When the restoration is bonded to the tooth, it’s 1mm. If the lab doesn’t know whether I intend to cement or bond, they cannot act as a check and balance for the accuracy of my preparation. I know many dentists who always bond in their e.max, so this simplifies things on the lab side. The lab can make a note in your profile that 1mm is the minimum thickness. However, for many of us today (especially if you’ve ever had to replace a bonded e.max crown), we want the flexibility to bond or cement. When you fill out that lab slip, simply note how you intend to seat the restoration. Check out this post from Dr. Brady on working more effectively with the lab by creating a more cohesive relationship. What do you think is the greatest benefit to (or challenge of) working with e.max? We’d love to hear from you in the comments!